If you’re a new homeowner, costs can quickly add up, especially when it comes to windows. Not only do you have to pay for each individual window and window frame, but you also need to find suitable window treatments. While it’s tempting to quickly slap something in front of each window, it will improve the overall decor of your home if you invest some time and research into the process. It’s not only possible to find tasteful, cheap window treatments, but easy as well, once you get the hang of it. To get started, check out our basic guide to cheap window treatments. The classic curtain is, not surprisingly, one of the most popular treatments available. 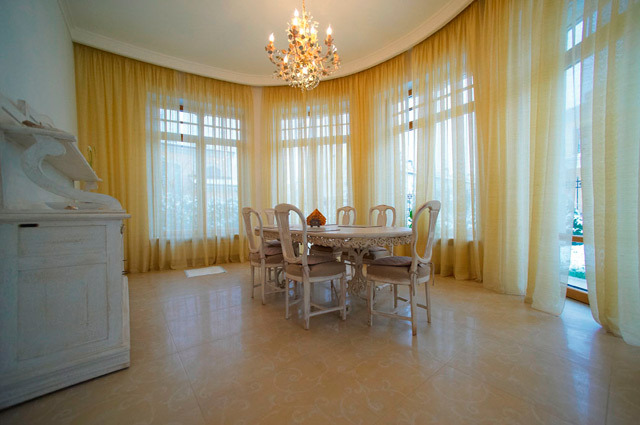 Well-placed curtains can provide warmth and comfort to a formerly austere room. Not only that, but curtains can also function as surprisingly cheap window treatments. A basic panel curtain can cost as much as $200 to $300. However, for the homeowner looking for cheap window treatments, a panel curtain can be purchased for $30 to $100, depending on size and material. Cafe curtains can be as cheap as $20 and often don’t range much higher than $100, while valances generally cost about $5 to $60. Again, while blinds could cost as much as $200, it’s possible to find cheap window treatments. A thrifty homeowner can purchase vinyl blinds for $20 to $60, while slightly nicer aluminum blinds can cost as little as $30 to $80. Shutters can be pricier than blinds. Custom shutters will be far more expensive than stock models; expect to pay $700 for a basic custom shutter, and as much as $4000 for fancier models. Luckily, non-custom shutters can be purchased for much less, generally falling between $40 to $100, depending on whether they’re interior or exterior shutters. In that case, even costly shutters can be cheap window treatments. Pricing for screens is different than for other window treatments, as they are generally priced by the square foot. A homeowner looking for cheap window treatments can easily get away with paying as little as 15 to 25 cents for a great fiberglass screen. As long as you keep your overall square footage in mind, screens can be a great choice for homeowners on the lookout for cheap window treatments. All in all, cheap window treatments are easy to incorporate into your home, once you spend a little time shopping around. For more information about the prices for each kind of window treatment, check out HomeAdvancement's window treatment articles. It's always helpful to consult with a professional, so be sure to try our database to find a quality contractor in your area.